While the urban centers of this period were enjoying such technological innovations as electric lights and indoor plumbing, the farmer’s personal lifestyle had changed little since the mid-century. Not until electric power reached farther into the rural areas, arriving in Dickerson in 1928, did indoor plumbing facilities for farm homes become prevalent; the cast iron water pump and the now-legendary outhouse were still common rural fixtures. The farmer’s house, illuminated by gas or oil lamps, glowed much the same as homes half a century earlier. The major changes in the community had been in farming practices and transportation. While the farmer’s personal habits and manners had changed little from those of his immediate ancestors, reapers, threshers and self-propelled steam engines, along with better systems of fertilization and crop rotation, had allowed him to realize harvests unimaginable to his father. And the new railroad, the Metropolitan Branch of the Baltimore and Ohio Railroad, which came through in 1873, gave him a quick, efficient way to get them to market. Running 41 miles from Washington to its junction with the old Main Line at Point of Rocks, the railroad had provided construction jobs for local day laborers and handymen and then maintenance work along the right-of-way, and white-collar jobs on the trains and in the many stationhouses. For the farmer it enlarged horizons by putting Washington and the County seat at Rockville within an easy day’s round trip; and more importantly, by widening the market for his produce and especially his dairy products. A large dairy industry grew along the right-of-way around Dickerson, where farmers were soon hauling five-gallon cans of cream to the 6 a.m. “milk train” for Washington. The other nearby commercial artery was the old Chesapeake and Ohio Canal, which lay at the mouth of Monocacy River at the bottom of a long grade. Built in the 1830s, the canal had fostered a wheat boom in the 1850s and 60s, but the mules plodding along the clay towpath to the Georgetown mills took a day or more as against an hour and a half to Washington on the railroad. Deteriorated by the ravages of the Civil War, a financial depression in the 1870s, and the great floods of 1877 and 1889, the Canal and the little community around Monocacy soon lost its Dickerson area customers to the railroad. Even though the area had been settled and farmed for nearly 150 years, and thanks to the C & O Canal, had enjoyed a measure of prosperity for some 40 years before the advent of the railroad, the beginning of rail service in 1873 transformed the economy and literally put Dickerson on the map for the first time: the Martenet and Bond map showed a few houses existing at Oakland Mills where the Old Baltimore Road crossed the Little Monocacy River, and several houses and Ephraim Harris’ General Store at the community of Mt. Ephraim, three miles north of Dickerson on Mt. Ephraim Road (see the Barnesville Town and Surround Trail). The railroad’s influence eventually consolidated this dispersed rural community into a small country town with a public school, a church, several stores, a town park, and even a town band. Despite their new proximity to Rockville and Washington, DC, farmers who lived in the Dickerson area in 1895 were still independent land-owning agriculturists. The farmer relied on the strength of his back and his own sharp axe for winter heat; home-grown grain fueled his transportation, the ox and horse; and the bulk of his table staples were produced on the farm. The farmer of 1895 retained many of the old ways that were passing out of the city dweller’s life then, and have all but vanished from society now. The now-forgotten sounds of the farmer’s life as well - the clopping of hooves on a hard-packed dirt road, the creaking of a wooden wagon axle, the clanging of the blacksmith’s hammer, interrupted occasionally by the rumble of a passing train - are a few of the aspects of the farmer’s life in 1895 that you can imagine as you travel. Park at the M-NCPPC recreation area (formerly the rural Dickerson Elementary School site) on Dickerson School Road, where this 11.7 mile tour begins. Head north on Dickerson School road, cross the tracks (carefully) and turn left to the Dickerson Station. 1891 had been notable for the Dickerson community, for in that year the Dickerson Station was constructed by the B & O Railroad. (Notice the date on the gable facing the tracks). 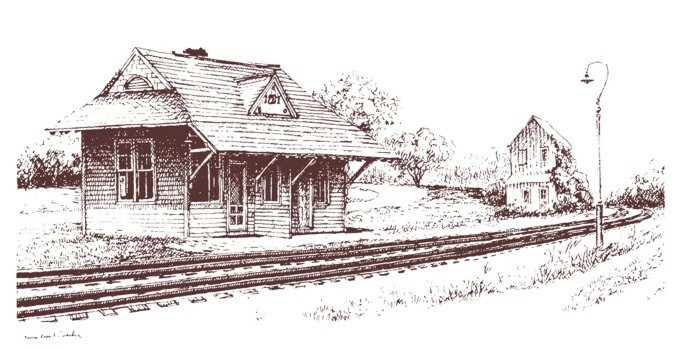 The original plan for a two-story brick building in the style of Rockville Station was abandoned for a cheaper model, but the Dickerson community was nevertheless proud of their wood frame and clapboard station. A formal symbol of the growth and importance of the Dickerson area, it also marked the center of the growing settlement. Until the station was built, its functions were housed in Dickerson’s Store and Post Office. For most of his every-day needs - groceries, meats, drygoods, clothes, fabrics, candy - and his mail, the farmer would come to W. H. Dickerson’s General Store and Post Office, established following the arrival of the railroad in the 1870s by the foresighted William Dickerson. Encouraged by the prosperity the railroad brought, he was able to offer his clientele such perishable delicacies as ice cream, brought to the store by rail from Frederick, via Point of Rocks. The original log and frame center section of the existing building (now covered with stained wood siding) has been moved twice, first from its original location to make way for the railroad in the 1890s, and later to allow for the widening of Mt. Ephraim Road. The old general store was important to the community for its social as well as its commercial aspects. It was here, sitting on the porch on a hot day, or around the pot-bellied stove in winter, that the unoccupied could come in for a lazy game of checkers, a spirited discussion of politics, or even for a Saturday hair cut. A blacksmith shop, now gone, was located next to Dickerson’s store and by the turn of the century Chiswell and Nicholson’s General Store was in competition with Dickerson’s. Located across the tracks, the store burned in 1932. Continue west on Mt. Ephraim Road to its intersection with Route 28. Turn right and ride about 50 feet. 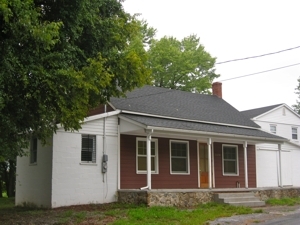 Across Route 28, where the Absolute Auto shop now stands, was located Sellman’s Boarding House and livery Stable. Established in the early 1890s by Frederick O. Sellman and his wife, these businesses rounded out the little commercial district of the railroad community of Dickerson. 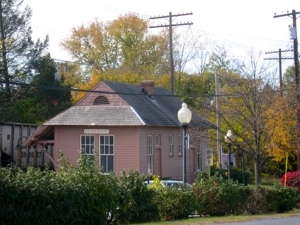 The boarding house, a rectangular two-story frame structure fronted by a porch, provided shelter for the Sellman family and offered four rooms to rent to travelers. Within convenient walking distance from the station house, the boarding house catered mainly to salesmen and tradesmen, or businessmen associated with the nearby quarries, who came to town on the train. Temporary telegraph operators and station masters stayed here as well. While the boarding house served people, the adjacent livery stable boarded, doctored, and bred horses, whenever any of these services was required. Sellman also furnished rigs, operating much like a modern-day car rental agency. Traveling men who came into town by rail could rent a horse and buggy to call on customers or businesses around the crossroads community. Besides providing this needed service for the traffic coming through Dickerson, Sellman also operated a race track near Nicholson Farm Road and Route 28. These enterprises were discontinued not long after the death of Frederick O. Sellman in 1902. Turn south on Route 28. Just past the railroad underpass, turn right onto Dickerson Church Road and follow it to the Dickerson United Methodist Church. While not completed until 1930, this church was built to succeed Mt. 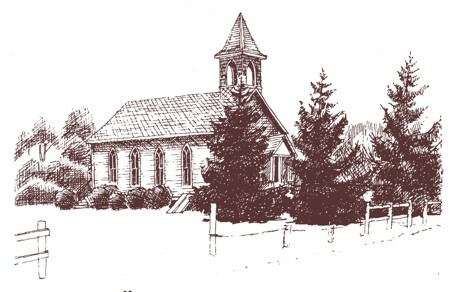 Pleasant Methodist Episcopal Church, founded in 1888 and located north of town on Mt. Ephraim Road (its graveyard, still used by the Dickerson congregation, may be seen three-fourths of a mile north on Mt. Ephraim Road). The location of the new church reinforced the development of the Dickerson area into a small town. Now an important community center, the church holds seasonal community dinners, strawberry festivals, and other events. Picture the old Mt. Pleasant Church with the horses tied at the hitching rail, and families mingling outside before the Sunday service: the men gathered in groups talking crops, the women in separate circles talking cooking and canning, and everyone talking about the weather. Slow travel on rutted local roads and the relative isolation meant the Sunday church gathering was an important weekly event in the family’s life. And if the sermon was too long, the church stifling in summer, or the pew hard and cold in winter, the thought of a sumptuous Sunday dinner with friends and family helped even the squirming child endure the service. While most farmers could grind their own corn at home, the milling of flour took a great deal more machinery than the farm ordinarily commanded. Hauling grain to the mill was a regular part of the farmer’s life, with the wheat bagged in burlap, strapped to a pack horse or stacked in a farm wagon. Here at the mill, the grain was run between giant granite millstones, turned by wooden gearshafts. The bran was then separated from the flour by screening, and set aside to be used as livestock feed. The resulting flour, unlike the modern bleached types, retained all of the germ and most of the partly ground husk of the grain. The Gott millers undoubtedly followed the practice of keeping a portion of the grain as “a graining fee,” and then selling it to traders or local merchants. Cycle (or walk) up Route 28 to its junction with Martinsburg Road. Just after the Civil War, a one-room school (no longer standing) was built southeast of the intersection of Route 28 and Martinsburg Road for the farm children of the Dickerson community. As was customary, the land was donated for the school, in this instance by the White family of Inverness Farm (across the road), to be returned if it ceased to be used for the school. The teacher usually “boarded around,” first with one family, and then with another. Most of the children walked to school, carrying their lunches with them, some having to trek over long stretches of muddy roads, and through all types of weather. The pupils ranged from 5 years old to about 16 - the older boys usually attending only in the winter months when they weren’t needed for farm work. Furnished only with a big stove in the center aisle for cold days, a row of desks or benches on either side, and the teacher’s desk at the front, the school room was a place where memorization and recitation were the keys to learning; school libraries were unknown. Hooks along the back wall provided a place to hang clothing. The children’s lunchboxes were placed on a shelf, and nearby stood the communal water pail, with its long-handled dipper, from which all drank. 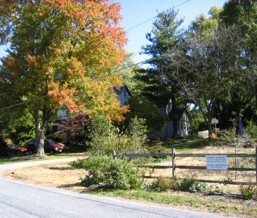 The Monocacy School operated until 1921, when it and the Poole’s Tract School (still standing north of Dickerson at the intersection of Barnesville and Mt. Ephraim Roads) were closed and consolidated into a new four-room building on Dickerson School Road, now the location of the M-NCPPC recreation area, where this trail began. The Dickerson School burned down in 1959. 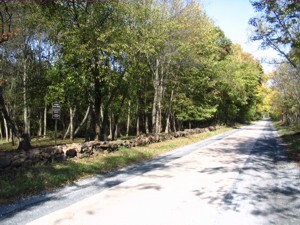 The section from Route 28 to Wasche Road was petitioned for in 1838 by a group of local farmers and businessmen to provide access to Gott’s Mill and other local mills, as well as a way to carry their goods to the C & O Canal and the Potomac River. Long stretches of the original sandstone walls still stand along this section of the road. Erected soon after the road was completed, the walls outline the route of the original road as well as its 20 foot width. They were constructed from a local rock known as “Seneca Sandstone,” found from Point of Rocks, Maryland to Manassas, Virginia, and a favorite building material all along the vein. On your right is Linden Park (private) identified by stone pillars which stand at the entrance, constructed in 1935 by Walter K. Matthews, who purchased Linden Farm (the next site) in 1932. Here the surrounding community enjoyed band concerts, often by the Dickerson or Poolesville band, in which several of Mr. Matthews’ family played. This sylvan retreat was the scene of picnics and family reunions, welcome diversions from rural isolation and the farm routine. In 1883, Lawrence White and his bride, Annie Belt, built a stylish farmhouse on this 255-acre farm, named for the linden trees planted on the property. Walter Matthews acquired the property in 1932, converted part of it to Linden Park, and built a bank barn, silo, and gothic dairy barn. The farmhouse was destroyed by fire in 1990. 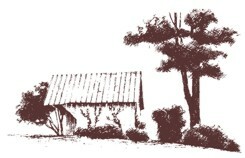 The county designated the gothic barn for preservation in 1992, and in the late 1990s it was leased to the Sugarloaf Citizens' Association, as part of a settlement of a lawsuit brought by the association challenging the county’s compost facility. With the help of the county, the SCA has restored the gothic barn and other structures as a community historic agricultural center and a showplace for green technologies. The county compost facility is adjacent to the farm, and in the distance you can see the coal-fired Dickerson power plant, now operated by Mirant Corp.
Look across the fields on your left to see the distant farm buildings of Inverness, a 19th-century farmstead. The home of four generations of the White family, the house was constructed in 1818 for Charles Willson. Near the manor house is an outstanding group of eight well-preserved outbuildings - slave quarters, a chicken house, smoke house, springhouse, two large corn cribs, a large stone bankbarn and a blacksmith shop - a complex of structures characteristic of most 19th century farmsteads, but now rare. The main route of the trail now turns left onto Wasche Road. For a side trip to an outstanding English bankbarn with protruding forebays, continue South on Martinsburg Road for 1.4 miles to the Trundle-Shreeve Farm, up a steep hill from Cherrington Wildlife Management Area. The magnificent “Seneca” sandstone bankbarn on your left was constructed circa 1830. This style of barn is an important local building type in which the hay was stored above and animals housed below. On either side of the recessed doors are extended dry cellars, used for the storage of grains and roots. The ground level facing away from the road offers stabling for horses and livestock. A row of stalls is located here, the openings protected from the weather by the overhang of the second level. The wood framing and floor joists are hand-hewn timbers. Notice the large cut quoining blocks on the corners of the buildings, and the cut stone lintels above the louvered windows. Across the road, the original section of the Trundle-Shreeve house (owned by those families throughout most of the 19th century) is the log and frame clapboard-covered north end. The long dwelling is one room deep, a characteristic local design. Head back to Wasche Road and ride 1.3 miles to turn left onto Hunter Road. You will be cycling through a varied farming landscape, with glimpses to the left of the area’s dominant natural feature, the 1,282 foot Sugarloaf Mountain. Turn right from Hunter Road onto Route 28, into the 250 year-old crossroads community of Beallsville. On one corner of the intersection is the Darby general store, built in 1910 by Harry C. Darby on the site of a blacksmith’s shop that dated back to the mid-1800s. The Darby store closed in 1974. 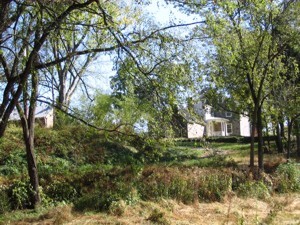 It was designated a historic landmark and acquired by the Maryland-National Capital Park and Planning Commission in 2004. M-NCPPC has begun stabilization plans for the store which is currently in poor repair. Stabilization will include moving the building back from the intersection. Archeologists working on the site in the summer of 2009 found oyster shells, nails, ceramic pipe stems, a 1918 liberty dime, and other clues to the history of the area. Across from the Darby store bordered by West Hunter Road and Route 28 is the Monocacy Cemetery, which dates back to the Revolutionary War. The Country Junction gift shop, next to the post office, offers refreshments. Now turn left onto Route 109 to continue a pleasant ride through farming country. Emerging from the wooded area at mile 10.5 the rider enjoys magnificent panoramas toward the west, with the Catoctins and distant Blue Ridge mountains visible on a clear day. From this height the landscape’s agricultural character can be appreciated on a grand scale. A long descent ends at the crossing of the Little Monocacy, an important mill stream. To see the old hand drawn Trail Guide site maps for The Dickerson Biking Trail (now out of date), please go here.